Welcome to Democrats Abroad Montreal! DA Montreal is a chapter of DA Canada, the official country committee for US Democrats living in Canada. A new executive board has recently been elected and we would like to connect and/or re-connect with all of our Montreal members who may be wanting to make a difference in the Democratic Party. We would really like to hear from everyone about their ideas, concerns, and suggestions regarding the work of this chapter. There are so many ways for us to make a difference and we value the input from our entire membership. Please use the email below to contact us. Visit our page often to get information on meetings, events, activities and information. There is renewed energy and commitment in our chapter and this will be a very exciting time for all US Democrats ici à Montréal. Below are the candidate statements for each office. Electronic ballots plus the RSVP link to attend the AGM will be distributed to registered members of the Chapter on March 11th and must be voted by midnight EST March 25, 2019. Hello, I am Brent Jamsa, and I would be honored to serve as the DA Montreal Chair. I recognize that the Chair is responsible for the general administration and well being of the chapter. This means we must work together to ensure the prosperity of our chapter for years to come. If elected, I pledge to work more closely with Democrats Abroad at McGill with coordinating events and discussion meetings. As well, I support the work being done to expand our DA university network. In terms of relevant experience, I have served as a Project Manager for Democrats Abroad at McGill since June. In this role, I was responsible for implementing and coordinating our phone banking operations to swing districts back home. Together, we made over 4,000 calls and a lasting impact. As well, I have previously served as a Page in the 438th General Assembly of Maryland and served four years in various portfolios in my countywide student council. One particular stint included a two year mandate as Legislative Affairs Director, which required that I be in constant communication with Maryland legislators regarding legislation that were of interest to public school students. Under my mandate, our keynote legislation finally passed the legislature and became law after multiple attempts under other Directors. Moreover, I served as Parliamentarian in my senior year, which demonstrates my interest in parliamentary procedure as it relates to running organized meetings with Roberts Rules of Order. With this, I humbly ask for your support. Thank you. My name is Randi Weitzner and I am running to be the next Chairperson of the Montreal Chapter of Democrats Abroad. No one in the Democratic Party, regardless of which of the many announced candidates one supports, can ignore the urgency of doing everything possible to stop another four years of Trump. I would have to say my number one priority for my work with DA right now is to reach out to each and every US citizen residing in and around Montreal and making sure that they are registered to vote in their home state and have requested an absentee ballot. The 2018 midterms showed the power of the youth vote and the absentee ballot vote and it is my mission through November 2020 to create our own Blue Wave in the “Great White North”. I would like to see the Montreal Chapter take on a more active role in a number of different areas: social activities, “educational” activities, political discussion groups. As a trained social worker, former employee of the New York City Department of Personnel and volunteer on various local government committees, I believe I possess the necessary interpersonal skills and government experience to make these things happen. Montreal is a diverse and vibrant city and I would like to see our chapter be that as well. This is an important time for Democrats. This is our chance to set things right and get our country back on track to serve ALL Americans, including those of us who have chosen to live and/or work in Canada. Let’s do this together. I urge you to get involved, take up the challenge and work with me to make our chapter a difference maker. I believe my leadership will get us there. Please cast your vote for me as Chairperson of the Montreal Chapter of Democrats Abroad. Hello, my name is Gib Primeau and I am a candidate for the Vice Chair position. I’m a lifelong Dem from Indiana, from a family that has voted blue going back to FDR at least. I have been living in Montreal since 2015 and work as a research assistant/collaborative coordinator at McGill. Prior to that, I was a social worker at a skilled nursing facility in western Washington state. In my career so far, I have made it a priority to be detail-oriented, conscientious, and to hold myself to a high standard, whether I’m writing something, organizing meetings or events, or advocating for clients. I always strive to be friendly and respectful to people, and to seek consensus. I feel a little guilty getting to live in Canada while such terrible things are going on back in the States, and I would like to make more of a contribution to the Democratic Party if I can. I am originally from Massachusetts and have been in Canada 34 years (in Montreal for 28). I’ve been an active member of DA Montreal for about ten or eleven years and was Vice Chair of our chapter for approximately two years during a time when we had a rather small active membership. Because of this, the boundaries between the Executive roles were very fluid with everyone chipping in to do what needed to be done. During this period, I was also a volunteer teacher at RECLAIM Literacy Centre while also serving on their board for five years, with three of those in a secretarial capacity. While I have opted to take a back seat for the past few years (two weddings to plan and health issues of various family members), I am eager now to seek a more active role once again. These are challenging times and I am excited to make my contribution, as small or as large as it may be. I look forward to meeting all of you and to carry on with the work of moving our chapter and the Democratic Party forward. Thank you!! No nominations received. Nominations for Treasurer will be accepted from the floor during the AGM. Bonjour Members of DemsAbroad Montreal!! The midterms and all run-off elections are over (not to mention the holidays!) and WOW, did y'all vote! Our stats tell us that Democrats Abroad voted as much as we have in presidential elections! Who makes that effort in a Mid-Term? YOU DO! Now that our GOTV efforts have subsided, we’ve turned inward to our own leadership and by-law amendments. Get ready—there will be a series of emails over the next few weeks as DA Montreal, DA Canada, and global Democrats Abroad host elections. I'm writing you now about the Montreal Chapter elections. We need YOU to consider to part of the organizing committee to WIN in 2020. Will you volunteer to join the Board of the Montreal Chapter? Click this link to access the nomination form. In the form, click on the positions to see the position descriptions. If you want to see change, now is the time to act. Let’s do more than vote. The deadline for submitting a nomination is 11:59PM EST February 12, 2019. The Annual General Meeting of DemsAbroad Montreal will take place Tuesday, March 26, 2019 at 6:30PM EST / Location: 688 Rue Sherbrooke Ouest, Room 361, Montreal, QC H3A 0B2. Watch your email for details. NO such thing as an alternative fact - Clinton à Montréal"
1. It is vital to get back up after being knocked down. Hillary believed that it was important that she serve as an example of this by not allowing herself to wallow in self-pity. One of the ways she has accomplished this has been to establish the “Onward Together” organization which supports grassroots efforts around the country. 2. Get more women involved in politics. Secretary Clinton expressed her concern about the double standard that still exists towards women in this area. She believes that women are liked and respected when serving others but not respected when advocating for themselves. The presence of more female voices would go a long way towards shattering this double standard. 3. There is no such thing as an alternative fact. Hillary is worried about the powerful interests that are working to make it harder to distinguish facts and falsehoods. She believes that we can not underestimate the Russian interference in our political system and stressed that this is a clear and present danger unless steps are taken to protect ourselves from this threat. She acknowledged that this is a new kind of cold war. 4. Refuse to be silent. Along the lines of “silence gives consent”, Secretary Clinton believes that the most effective way of striking down intimidation is by speaking up and speaking loudly. Clinton remains optimistic and is encouraged by the positive, proactive energy that has come out of the disappointment over the election result. “People like us [that are] willing to stand up for timeless principles and values fill me with hope. We are on the right side of history." Fierte Montréal, Montréal's biggest Pride Parade and our 1st! "Y'ALL means ALL" was chanted down Boulevard René-Lévesque. It was a remarkable feeling to promote what we stand for and walk for - Civil Rights. We watched people read and react to our signs by smiling, cheering and giving us hugs. We also invited Americans we met along the way to join us - even mid-parade! Thanks to your mobilization and involvement, our chapter joined over 100 organizations and 7,000 people in this year's biggest Pride Parade yet to emphatically share that minority rights are human rights. The feeling of PRIDE was also in our hearts in the wake of Charlottesville. A day of racist, anti-Semitic and anti-LGBTQ protests where a terrorist slammed his car into a crowd of counter protesters, killing Heather Heyer and injuring almost 20 others. 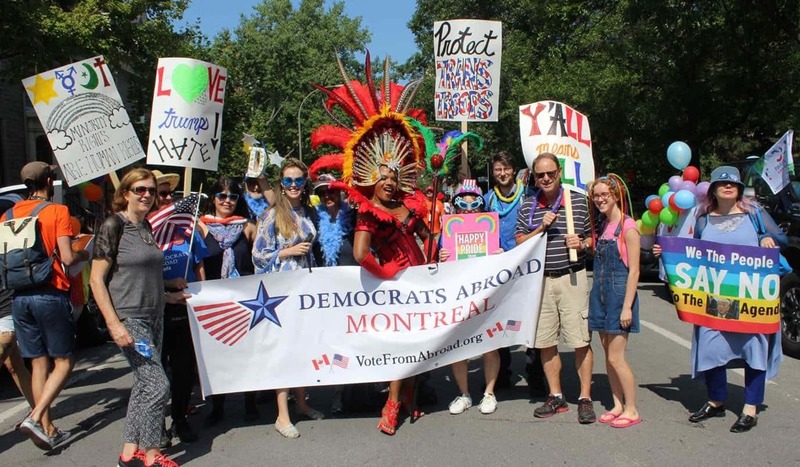 Democrats Abroad Montréal recognizes a new pride flag which includes black and brown colors to fuel this important and inclusive conversation. We must, and will, continually fight to make our country one in which atrocities such as this, and the beliefs that underpin them, cannot be imagined, much less put to action. We stand together, and we stand strong. On Tuesday afternoon, I had the privilege to attend Barack Obama’s powerful speech with several of my colleagues on the Democrats Abroad Montréal leadership team. Together, we listened to our dearly-missed commander-in-chief offer his invaluable insights on a number of pressing challenges before the United States today, notably the uncertain future of American leadership on the global stage and the threat of climate change in the wake of President Trump’s withdrawal from the ground-breaking Paris Agreement. Yet, true to form, Obama invigorated and inspired a sold-out crowd at Palais des congrès with his unceasing hope for humanity and conviction in his presidency’s long-term impact. “We came together around the most ambitious agreement in history to fight climate change,” he reminded us. With a rapidly-expanding pledge signed by thousands of cities and organizations to uphold America's commitment to the Paris Agreement, we show the world that we will move forward on climate change with or without the current U.S. presidential administration. We also cannot give in to reactionary forces of ignorance or self-serving “populists” that consciously manipulate fears surrounding globalization. Pragmatic voices like Obama rouse each of us to action as my colleague David Shelton acknowledged Wednesday in a radio interview with CBC. Our opposition party is at a watershed moment for American democracy; and WE have an unique opportunity to shape the political conversation! Join our new public Facebook page to stay updated on events and news!